The damage caused in the March 14 Lhasa riots is estimated at 280 million yuan ($40 million), almost double the earlier figure of 150 million yuan ($21.4 million), Tibet's top official said Wednesday. Eighteen people were killed and hundreds injured in the riots. "As chairman of the Tibet autonomous region, I failed to protect the people in Lhasa. 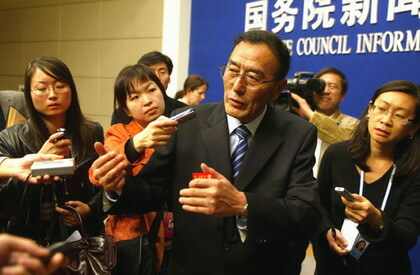 I deeply apologize for that," Qiangba Puncog told a press conference organized by the State Council Information Office. A total of 953 riot suspects have been detained, of whom 403 have been formally arrested, according to figures released Wednesday. About 360 people turned themselves in to the police, 328 of whom have been set free because they committed minor offenses and were willing to cooperate. Only 13 of the 93 suspects listed as the most wanted have been caught. Qiangba Puncog stressed that the rioters were "an extremely tiny minority" of Tibetans; and the monks who took part in protests were also "an extremely tiny minority" of the Buddhist clergy. "They do not, and cannot, represent Tibet and the Tibetan people," he added. Qiangba Puncog promised that the government would do whatever necessary to help those affected by the riots, such as reducing taxes and providing interest-free loans. He added that the local government offered compensation to families of the 18 innocent civilians who lost their lives; and affected factories and businesses also received government subsidies. The government quickly restored public facilities such as power supply and telecommunications, he said. "The lives of people in Lhasa have now returned to normal", he said. The chairman also expressed confidence in a successful Olympic torch relay in Tibet. "I have noticed the recent activities of some secessionists in London and Paris," he said. "As a Tibetan, I feel ashamed of them." Qiangba Puncog said he believes that some secessionists will continue to use the torch relay to publicize their illegal cause. "We will fully prepare for it." He said the autonomous region will take some security measures but will not impose a curfew or suspend classes during the relay in Tibet. In response to a question about the monks who spoke to foreign reporters in Johkang Temple during their recent Lhasa visit, Qiangba Puncog said none of the monks have been, or would be, penalized. "It is natural for some lamas to have their own opinions," he said. "The monks are still in Johkang Temple and will continue to be there if they do not participate in any law-breaking activities," he added. A group of monks disrupted the media trip to Johkang Temple on March 27 when reporters from 19 foreign and Chinese media organizations paid a three-day visit to Lhasa after the March 14 violence. But Qiangba Puncog made it clear that what the monks said is untrue. Citing a monk who claimed that the authorities killed more than 100 people in Lhasa, he said that the monk later admitted he learned this from the Voice of America. Foreign reporters can still visit Tibet after going through prescribed procedures, he said. "But for safety reasons, foreigners and foreign media need to follow relevant regulations. We neither want to restrict media coverage nor have anything to cover up," he said.